Please Santa, can we skip the Moon Sand? Warning to anyone who bought the guys Moon Sand for Christmas: Take it back. Take it back right now and no one will get hurt. Admittedly, I have no actual experience with Moon Sand, but I know it’s evil. Googling “Moon Sand” and “evil” yields at least a gig of scathing criticism. Four out of five moms at Boots’ preschool say it’s evil – the fifth had no direct experience, but she’d also heard that it’s evil. And the problem is, the commercials make it sound so exciting. Craft your own creation from the colorful grains, smash it and start over after your mom’s cleaned the mess from the house, your hair and your clothes, that is. Admittedly, I’m a little off mainstream when it comes to toys I consider evil. Most of the ones that appear on many lists – beads, bubbles or Lite Brite – I’d actually love the guys to have. The ones that bug me are the ones that give me a headache – either a literal one or a figurative one that comes with cleaning up. And I’ve been lucky so far. 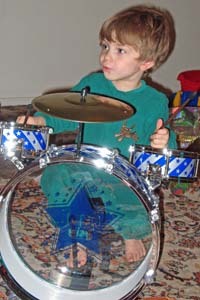 The only truly obnoxious Christmas I’ve endured was when not one but two so-called friends gave Big Guy drums as a gift. Oh, how they beamed as he grinned after he opened them. Oh, how I glared and made a mental note to call the IRS and suggest that these folks deserved an audit. Fortunately my migraine ended a few days later when an older kid who was visiting drummed a little harder than the made-for-toddlers set would endure. Snare snapped and bass busted, the beloved gift headed for the garbage. I was really sad for Big Guy. I was really happy for my head. Each year since, I’ve managed to steer clear of a minefield of playthings I’d rather not have in my house. With the exception of the satanic police car two summers ago and the space-hogging Banana Boys this fall, I’ve been lucky. No toy has had to die in the dead of night in ages. Let’s keep it that way, folks. Please, ditch the Moon Sand. We live in the desert. Do we really need more sand anyway? Ha! I’ve heard that stuff makes a big mess. Nope no moon sand here for Christmas.